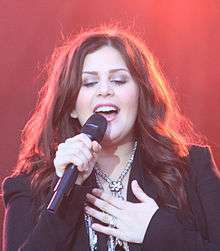 Hillary Dawn Scott-Tyrrell (born April 1, 1986), known professionally as Hillary Scott, is an American singer and songwriter. She is the co-lead singer of Lady Antebellum, a country music group that was formed in 2005 and signed to Capitol Nashville. With her family, she released the top 10 album, Love Remains, in 2016. Scott was born in Nashville, Tennessee, to country music artist Linda Davis and Lang Scott, a musician and entrepreneur. Her family is Scottish-Native American. She has a younger sister named Rylee Jean (2000). Hillary was homeschooled on the road for kindergarten. She attended elementary school and high school at Donelson Christian Academy where she graduated in 2004. She lived with her grandparents during that time while her parents were on the road touring. After joining her mom on stage for a Christmas show, she was convinced to pursue a music career. She sibling younger sister, Rylee Jean Scott. Scott decided at age 14 to become a country singer, and Rylee is 14 years younger than she; so she has a tattoo of the number 14 in honour of these two things. After high school she attended Middle Tennessee State University to help her music career grow and to also improve it. During her time at MTSU, Scott worked with singer-songwriter Victoria Shaw and earned some publicity, but was unable to secure a contract with a major label. She auditioned for American Idol twice, but failed to make it through to the judges round in both cases. Then she met future bandmates Charles Kelley and later, Dave Haywood, in May 2006. She ran into Kelley at a Nashville bar and recognized him from his MySpace page, where she had been listening to his music. She introduced herself to Kelley and complimented him on his music, which led to his deciding that they should get together with Haywood and write songs. The first song they wrote was "All We'd Ever Need". The song was originally written for her to perform; she convinced Kelley it should be a duet, which led to the forming of Lady Antebellum. The group first performed together in August 2006 and signed a record deal in 2007. Scott claims that being lead singer of Lady Antebellum, as opposed to being a solo artist, lessens the pressure on her on stage. Scott formed the country music group Lady Antebellum in 2006 with co lead singer Charles Kelley and back up singer Dave Haywood. They released their debut single, "Love Don't Live Here", on October 2, 2007; it entered Billboard's Hot Country Songs chart that year, peaking at No. 3 in early 2008. Their self-titled debut album was released on April 15, 2008, and debuted at No. 1 on the Top Country Albums chart. It consisted of eleven songs, ten of which were either written or co-written by the members of the trio, and was produced by Paul Worley and Victoria Shaw. The trio released their second single, "Lookin' for a Good Time", in mid-2008; it peaked at No. 11 in December of that year. Their third single, "I Run to You", became their first Number One hit on the Hot Country Songs chart in July 2009. The album was certified platinum by the RIAA three months later, in October 2009. In August 2009, Lady Antebellum released "Need You Now" as the title track of its sophomore album. The song topped the Hot Country Songs chart for five weeks in late 2009 before peaking at No. 1 and No. 2 on the Adult Contemporary and Hot 100 charts, respectively, in early 2010. Need You Now was released on January 26, 2010, and debuted at No. 1 on Billboard's Top 200 Albums chart with first-week sales of almost 481,000 copies. The album consisted of eleven songs, eight of which were co-written by the members of the trio, and showcased production by both the trio and Worley. The next two singles from the album, "American Honey" and "Our Kind of Love", reached No. 1 on the country charts in April 2010 and September 2010, respectively. The album was certified triple platinum by the RIAA in October 2010. Its fourth and final single, "Hello World", peaked at No. 6 on the country charts in April 2011. In May 2011, Lady Antebellum released "Just a Kiss" as the first single from their third studio album, Own the Night, which was released on September 13, 2011, and became their fifth number one hit. "Just a Kiss" was 2x certified Platinum by the RIAA. It stayed on the Hot 100 for forty-two weeks. The second single "We Owned the Night" also became a number one hit and was certified Gold. The third single "Dancin' Away with My Heart" was also certified Gold and peaked at number two. "Wanted You More" was released as the fourth and final single from the album. It was their first single since "Lookin' For a Good Time" to miss the Top Ten. The band supported the album with their second headlining tour, the Own the Night Tour which was also their first arena and world tour. Shortly after the release of On This Winter's Night, Lady Antebellum started working on their fifth studio. Golden was released on May 7, 2013. "Downtown" was the album's first single and peaked at number two on Country radio and number one on the US Country Airplay chart. It was certified platinum by the RIAA. The second single was "Goodbye Town". In late 2013, the deluxe edition re-issue of Golden was released which included the third single "Compass". "Compass" was met with positive reviews and went number one on the Country Airplay chart. Throughout 2014, the band toured the album on the Take Me Downtown Tour. In November 2015, it was reported that Scott was working on a gospel album. On April 22, 2016, she posted a handwritten note online about the project. In the note she expressed her excitement about it, announced the album's title, Love Remains and formally introduced "Hillary Scott & the Scott Family". On why making a gospel album she explains, "Well, I wanted to make this album to share more of who I am. These songs, and many like them are the cry of my heart. I have been singing songs like this my whole my life whether it be in church, with family and friends gathered around with guitars on my screened porch, rocking my baby girl to sleep or while holding the hand of a dying loved one." It features her parents Linda Davis and Lang Scott, and her little sister Rylee. The lead single "Thy Will" was released on April 22, 2016. It will feature original material and gospel standards. Scott penned the newer material with her family, and Ricky Skaggs will be the producer for the album. Scott's other works include singing background vocals on Luke Bryan's song, "Do I", which fellow Lady Antebellum bandmates, Charles Kelley and Dave Haywood, wrote alongside Bryan. The song was released to radio in April 2009 and peaked at No. 2 on Billboard's Hot Country Songs chart in December of that year. Scott has recorded a duet with Dave Barnes called "Christmas Tonight" and was featured with Kelley and Haywood, as Lady Antebellum, on Maroon 5's "Out of Goodbyes". "Christmas Tonight" was a single off Barnes' 2010 holiday album, Very Merry Christmas, and peaked at No. 9 on the Adult Contemporary chart on New Year's Day, 2011. "Out of Goodbyes" was included on Maroon 5's 2010 album, Hands All Over, but was never released as a single. In addition, Scott has co-written songs for other country artists, including Sara Evans' "A Little Bit Stronger" and Blake Shelton's "Suffocating". "A Little Bit Stronger" featured Scott on harmony vocals and was released in September 2010 as the lead off single to Evans' sixth studio album, Stronger. The song was widely used in the 2010 film, Country Strong, and topped the Hot Country Songs chart in May 2011 for two weeks, becoming Scott's first-ever Number One hit recorded by another artist. "Suffocating" was written by Scott with Shelton's ex-wife, Miranda Lambert, and recorded by Shelton for his 2010 EP, All About Tonight. Scott appeared on season 4 of The Voice as a mentor for "Team Adam". In 2016, she presented Gospel Hour for BBC Radio 2 Country. Scott married Nashville-based drummer Chris Tyrrell on January 7, 2012. The two first met in college and reconnected when Lady Antebellum and fellow country music band Love and Theft, in which Tyrrell was the drummer at the time, both served as opening acts on Tim McGraw's Southern Voice tour in early 2010. They began dating in July 2010. After their relationship began, Tyrrell filled in for Lady Antebellum's drummer for a month in August 2010. When Lady Antebellum released "Just a Kiss" in May 2011, Scott hinted that the song was inspired by her relationship with Tyrrell, saying, "We love writing songs from personal experience, and this is definitely one of those songs. There is so much excitement at the beginning of a new relationship ... all the butterflies and that optimistic feeling that this person could be 'the one.' This song is about one of those times when your brain kicks in and tells your heart 'good things are worth waiting for.'" Tyrrell proposed to Scott on July 2, 2011, during a family vacation in east Tennessee, and the couple wed in upstate New York on January 7, 2012. No wedding date had been announced, and on January 8, the couple posted a video on Lady Antebellum's website announcing that they were married. In October 2011, Tyrrell became a full-time member of Lady Antebellum's band as their new drummer. Scott has two tattoos, a music note on her right foot and the number 14 on her right wrist. The 14 has two meanings. It represents the age at which she decided music is what she wanted to do for a living and the age difference between her and her younger sister Rylee Jean Scott. "—" denotes a collection that did not chart or was not released to that territory. Since 2008, Scott and Lady Antebellum have been awarded many top awards in the music industry. Some of the top accolades include seven Grammy awards, seven Academy of Country Music awards, six Country Music Association awards, and CMT Artists of the Year honorees in 2010 and 2011. Scott was also named SESAC songwriter of the year in 2008, 2010, and 2011. In 2011, her publishing company, Hillary Dawn Songs, shared publisher of the year with EMI Foray Music at the SESAC awards. She also has three Academy of Country Music awards, as producer of the album Need You Now, as producer of the single "Need You Now", and as songwriter for "Need You Now". ↑ Scarlett, David (May 5, 2008). "Destined to be Together: Lady Antebellum's story of rejection, homemade drums, and a big leap of faith lead them down the path they were meant to follow - each other". Country Weekly. 15 (9): 42–45. ↑ Horner, Marianne (April 19, 2010). "Lady Antebellum's Hillary Rejected by 'American Idol'!". TheBoot.com. Retrieved May 7, 2011. ↑ "Hillary Scott/Lady Antebellum". Digital Rodeo. Retrieved July 2, 2009. ↑ "Lady Antebellum Biography". GAC. Retrieved May 7, 2011. ↑ ABC News (October 5, 2015). "Lady Antebellum to Take 'Family Time' After Tour; Charles Kelley Working on Solo Project". gma.yahoo.com. Yahoo - ABC Networks. 1 2 Betts, Stephen L. (November 20, 2016). "Lady Antebellum's Hillary Scott Recording Gospel Album". Rolling Stone. Rolling Stone. Retrieved April 22, 2016. 1 2 Parton, Chris. "Hear Lady Antebellum's Hillary Scott Go Gospel With 'Thy Will'". Rolling Stone. Rolling Stone. Retrieved April 22, 2016. ↑ Deusner, Stephen M. (May 22, 2009). "Luke Bryan - "Do I"". The9513.com. Retrieved March 26, 2011. ↑ "Luke Bryan Album & Song Chart History - Country Songs". Billboard. Prometheus Global Media. Retrieved April 13, 2011. ↑ Leahey, Andrew. "Very Merry Christmas". Allmusic.com. Retrieved November 11, 2010. 1 2 "Dave Barnes Album & Song Chart History - Adult Contemporary". Billboard. Prometheus Global Media. Retrieved January 21, 2011. ↑ Jurek, Thom (March 8, 2011). "Stronger - Sara Evns". Allmusic.com. Retrieved March 9, 2011. ↑ "Sara Evans Album & Song Chart History - Country Songs". BIllboard. Prometheus Global Media. Retrieved May 23, 2011. ↑ Jurek, Thom (August 10, 2010). "All About Tonight - Blake Shelton". Allmusic.com. Retrieved August 11, 2010. ↑ "Hillary Scott's New Man". CountryLowDown.com. December 2, 2010. Retrieved April 16, 2011. ↑ Lipshutz, Jason (May 3, 2011). "Lady Antebellum Teases Next Album with 'Just a Kiss' Single". Billboard.com. Retrieved May 5, 2011. 1 2 West, Kay (July 5, 2011). "Lady Antebellum's Hillary Scott Is Engaged". People.com. Retrieved July 5, 2011. ↑ Hackett, Vernell (March 26, 2010). "Lady Antebellum Think About Their Ink". TheBoot.com. Retrieved March 30, 2011. ↑ "Lady Antebellum Lead Singer Double Whammy:Buy". Retrieved August 28, 2012. ↑ "Hillary Scott's Sister Busted Pirating Music!". WWYZ. January 27, 2013. Retrieved March 9, 2013. ↑ "Hillary Scott Welcomes Daughter Eisele Kaye". People. Retrieved July 22, 2013. ↑ Lady Antebellum's Hillary Scott channels grief into gospel by Cindy Watts ciwatts @ tennessean.com 10:06 p.m. CDT July 30, 2016 http://www.tennessean.com/story/entertainment/music/2016/07/30/lady-antebellums-hillary-scott-channels-grief-into-gospel/86949536 Hillary Scott was prepared to heavily dose herself with pain medication — she wasn’t going to miss Lady Antebellum’s first headlining concert at Nashville's Bridgestone Arena last September. It wouldn’t have mattered if she did. Advil won’t heal a broken heart. Most people didn’t know it, but when Scott walked on stage, the singer was about nine weeks pregnant. At a doctor’s appointment earlier that week, she found out something might be wrong....The following week, she learned she'd lost the baby. Scott leaned on her family and her faith even more and with their help and the support of Nashville’s music community, she turned her darkest hours into music that reflects hope and light. For Love Remains: "DJ Khaled Earns His First No. 1 Album on Billboard 200 Chart With 'Major Key'". Billboard. Retrieved August 8, 2016. For Love Remains: "Top Country Albums" (The Week Of: August 20, 2016). Billboard. Prometheus Global Media. Retrieved 9 August 2016. For Love Remains: "Top Christian Albums" (The Week Of: August 20, 2016). Billboard. Prometheus Global Media. Retrieved 9 August 2016. For Love Remains: "CHART WATCH #380". auspOp. August 6, 2016. Retrieved August 6, 2016. For Love Remains: "Chart Search". Billboard Top Canadian Albums for Hillary Scott. Retrieved 9 August 2016. ↑ Shelburne, Craig (June 20, 2016). "Hillary Scott Reveals Track Listing, Release Date For 'Love Remains'". MusicRow. Retrieved June 21, 2016. ↑ Bjorke, Matt (October 30, 2016). "Top 10 Country Albums Sales Chart: October 31, 2016". Roughstock. ↑ "Hillary Scott - Chart history". Billboard Hot Country Songs for Hillary Scott. Retrieved 9 August 2016. 1 2 "Hillary Scott - Chart history". Billboard Hot Christian Songs for Hillary Scott. Retrieved 9 August 2016. For "Love Remains": "Chart Search". Billboard Hot Christian Songs for Hillary Scott. Retrieved 9 August 2016. For "Thy Will": "Christian Songs: Top Christian Airplay Songs Chart" (The Week Of September 24, 2016). Billboard. Prometheus Global Media. Retrieved 9 August 2016. For "Thy Will": "Chart Search". Billboard Bubbling Under Hot 100 for Hillary Scott. Retrieved August 9, 2016. ↑ Bjorke, Matt (November 7, 2016). "Top 30 Digital Country Singles Chart: November 7, 2016". Roughstock. ↑ "CMT : Videos : Hillary Scott : Thy Will". Country Music Television. Retrieved June 20, 2016. Wikimedia Commons has media related to Hillary Scott.